Today, April 10, 2018, is a day we all should contemplate, especially as women. That’s because today is Equal Pay Day, established by the National Committee on Pay Equity (NCPE) to expand public awareness on the wage gap between men and women. Why April 10? NCPE says It’s a symbol of how far into the year we have to work in order to earn what men earned last year. Depending on what state you live in, women get paid 70 to 80 cents for ever dollar a man gets paid. The wage gap is even greater for women of color. And let’s remember, it impacts families, not just women. 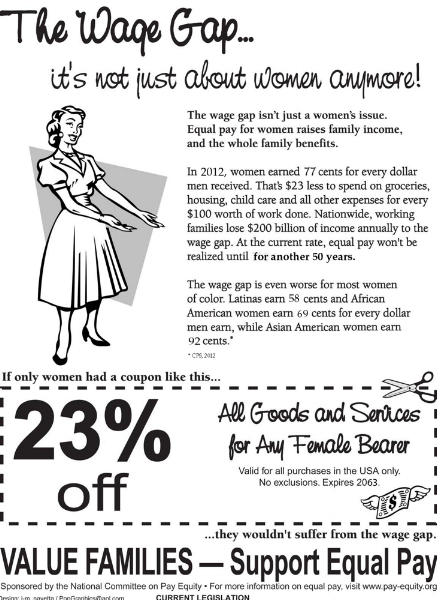 As NCPE cleverly illustrates, if there wasn’t a wage gap, we wouldn’t need this coupon. Is it just us, or do you find it hard to believe this is still the case in 2018? Come on already, world! Instead, we teach them to pause, take a breath, say thank you, and buy a couple of days to think, review, and talk to advisors…then start negotiating for all they can. You’ll never have as much bargaining power as you do at the moment an employer wants to hire you. It’s much harder---and slower--- to try to make up the difference later. To learn more about Equal Pay Day and what you can do, go here and here. Call or tweet your Senators, State Representatives, and the White House (I just did). And if you or a woman you know is either job searching or contemplating it, consider telling her about Life Working®. We love doing our small part to help close the wage gap. Let's get this done. Newer PostWho Needs a Resume Writer?